Benny Zable’s Greedozer costume, the full face gas-mask with the red radioactive sign on the end of the filter canister, was a regular feature at many demonstrations in the 1980s. He was a living sculpture with a message. Zable’s gas-mask along with other the ephemera of mass protest demonstrations has been curated at the City Gallery in the Melbourne Town Hall in an exhibition curated by Malcolm McKinnon. The small exhibition traces the history of protests in Melbourne from 1962 Women’s Day marches through to recent anti-fascist protests. There is a “wreck the draft poster” from the Students for a Democratic Society printed on National Service Registration forms. And an improvised cardboard sign from the taxi driver protests that block Flinders Street in 2008. There is no denying the cultural importance of these events and images; protests are part of the spectacle of a democratic society. A photograph of a young Aboriginal protester from the 1976 in front of the Captain Cook Cottage still resonates with the current statue wars. Along with photographs and posters, there are protest signs in the exhibition but no banners; there wasn’t enough space in the small gallery and, maybe all the good old trade union banners are at the Potter Museum of Art’s exhibition State of the Union (I don’t know I haven’t seen it yet). The photographs of banners makes me wonder if protest marches are reconfigured religious processions, mass displays of passionate faith. The exhibition attempts to give a balance between the government/police and other views. But can there ever be a balanced when the police using batons against peaceful protestors or driving over them with a police car at the S11 protests? The pretence that there is a tolerance of protests is one of the foundations of the illusion of a liberal democracy. Winter is here in Melbourne but I’m thinking about the public sculptures in Catani Gardens and walking by the beach in the summer. St. Kilda was Melbourne’s first beach front suburb and has been on the decline since it was established in the gold boom era. Some might claim that this decline has been arrested since the hight of its seedy existence in the seventies but this might only be temporary as there were earlier attempts. Often these attempts involve urban redesign and the addition of sculpture and other monuments. The Catani Gardens were established in 1906 and developed as a tourist attraction on reclamation work on the land. 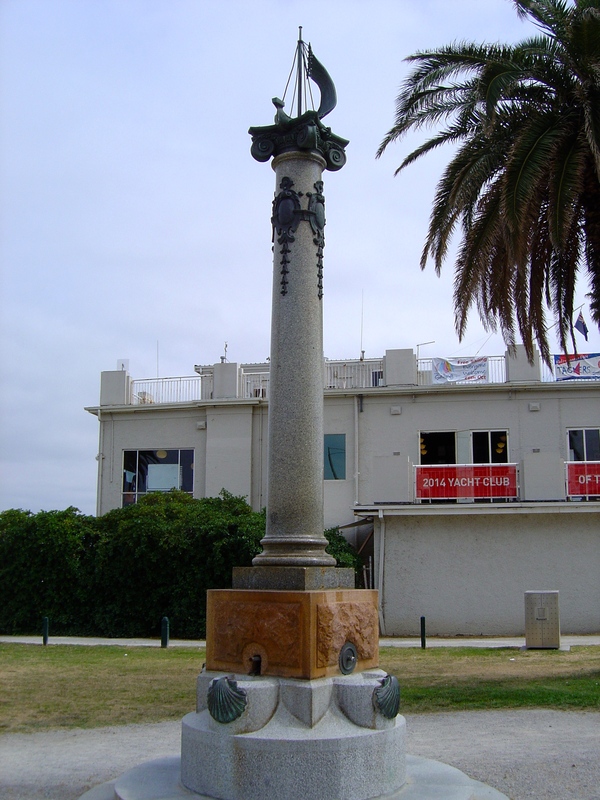 It extends along the St. Kilda foreshore from the pier to where Beaconsfield Parade meets Pier Road. 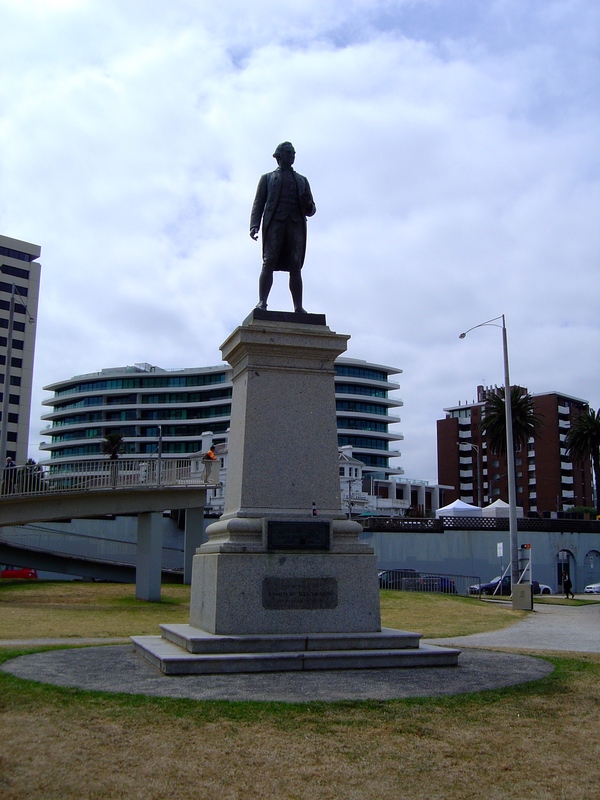 The gardens were then known as Captain Cook Lawns as the Captain James Cook Memorial stands near the intersection of Fitzroy Street and Jacka Boulevarde. It is another edition of the Cook Memorial by Sir John Tweed. Erected in 1914 only two years after the memorial in Whitby, England was unveiled. The local council intended to have a collection of statues representing British navel heroes to accompany Cook. The statute was relocated in 1988 to it current location to make way for a bicentennial rotunda, perhaps mapping the popularity of Captain Cook as a figure in Australian popular culture. The only other navel figure in the park is the bust of Vice-Admiral Sir William Rooke Creswell founder of the Australian Navy. The bust was original installed in 1938 five years after his death in 1933. The bust stares out to sea and sheltering several spiders. It is not in its original location on the edge of the footpath as it was moved when the road was widened. The bust of the Vice-Admiral was stolen sometime in the nineteen-seventies and was never recovered; stolen bronze sculptures never are, they are melted down for the metal (see my post Stolen Sculptures). The current bust is new, recast from the original plaster mould. Did the English or European foundry keep the mould (there were no Australian sculpture foundries at the time) and if so why isn’t the sculptor known? 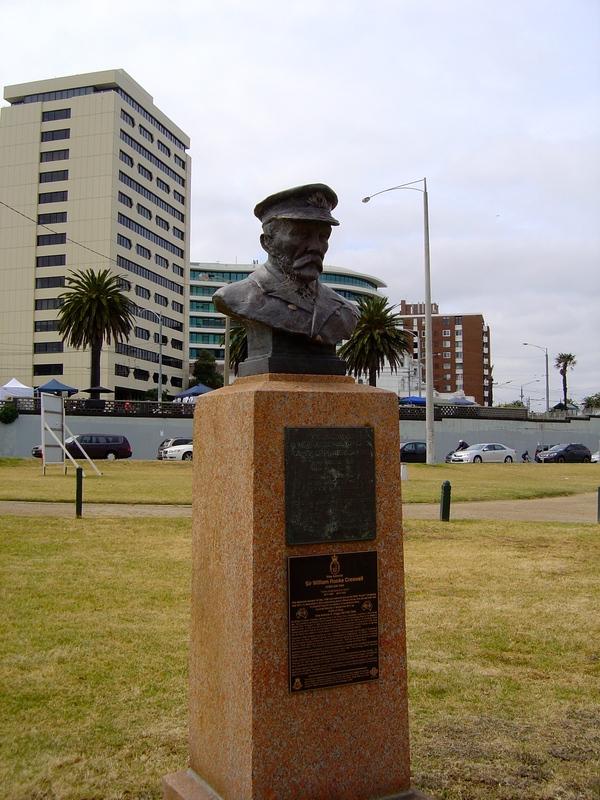 The bust was restored as part in the 100th anniversary of the Royal Australian Navy and an additional copy was made for the HMAS Creswell Naval base at Jervis Bay, NSW. The ornate pillar with the sailing boat on top also has a nautical theme is the Sali Cleve drinking fountain designed by Charles Adam Irwin and erected in April 1911. It has also been relocated because of road widening. The Catani Clock Tower was dedicated on the Saturday 22nd August, 1932 and presumably the gardens renamed at the same time. The Italian-born civil engineer, Carlo Catani worked for St. Kilda Public Works Department and design the gardens. Clock towers were an important part of civic infrastructure before everyone carried one in their mobile phone. 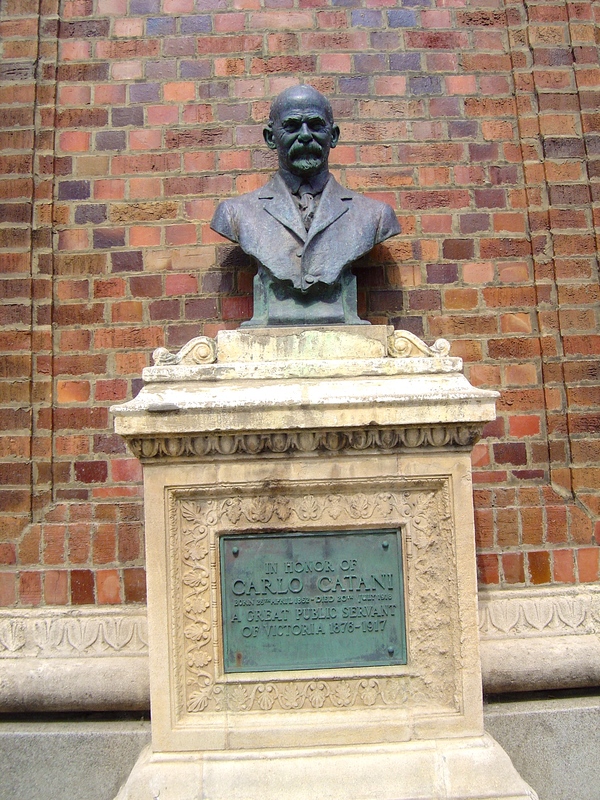 The brick memorial clock tower has a bust of Carlo Catani by Paul Montford and a bronze plaque that reads: “In Honour of Carlo Catani” “A Great Public Servant Of Victoria 1878-1917”. Creating sculptures for architectural war memorials, like figures on the Shrine of Remembrance or the Cenotaph in St Kilda was what Montford most wanted to do but mostly he made busts. The gardens still retain some of their original Edwardian formality and enterprise, it still looks like is a place to promenade and admire bronze statues of worthy notables, although now people are wearing significantly less formal attire. The rough volcanic rock walls are from another era of garden design. They look like parts of the Alexandra Gardens by the Yarra River that was established in 1901 not surprising given both were laid out by Catani.